At Able Hearing, our team is experienced in providing thoughtful, patient-centered care and hearing aid fittings with leading manufacturers. We are inspired by a commitment to providing people with full access to their lives through better hearing health. Hearing loss is the third most common medical condition in the US, but it is often undiagnosed and undertreated. In part, because it is an invisible condition, people do not immediately recognize that what they are experiencing is hearing loss. Especially when it comes to sound and conversation, people may think that the volume is simply not loud enough or that everyone is mumbling. Once it becomes clear that hearing loss may be the culprit, it is important to schedule a hearing test. The Hearing Loss Association of America estimates that people wait an average of seven years from the time they first experience changes in their hearing to the time they decide to seek treatment. If you have made plans to visit us at Able Hearing for a hearing test, congratulations! Our team is excited to meet you and help you on the journey to better hearing. Here are a few things you can expect at your upcoming hearing test. Hearing loss is a major part of every part of our life, from our relationships to our employment. Before your visit, take some time to think about when and where you struggle most with hearing. Also, run through a schedule of your day so that our team has a good idea of your lifestyle. If a hearing loss is detected, this information will be helpful in finding the best treatment. Also, be prepared to provide our team with information about your personal medical history, as well as your family’s. If you are currently on any medication, or if you’ve had a cold in the days prior to the hearing test, be sure to remember to tell us, as this could also affect your hearing abilities. Consultation with our team: When you first arrive, we’ll have a conversation about all of the above items – your personal and family history, if you’ve been on any medications or if you’ve had a cold or sinus issues in the past few days, and if you have been exposed to loud noises recently. In some cases, these factors may interfere with accurate results for the test. We’ll also ask about your daily schedule, physical activities, employment information, etc. as this will be valuable later. Physical examination: Next up, your hearing specialist will perform a painless physical examination, utilizing an otoscope to examine your ear canal and ear drum. They will be checking for any blockage in this area, perhaps from impacted earwax, as well as any damage to the eardrum, such as perforation or rupture. Hearing tests: You will sit in a soundproof room while your hearing specialist plays a series of tones through your headphones. Each ear will be tested separately. When you hear a sound, you will be asked to raise your hand or push a button. These tones will be played first a low volume and will increase until you can hear them. 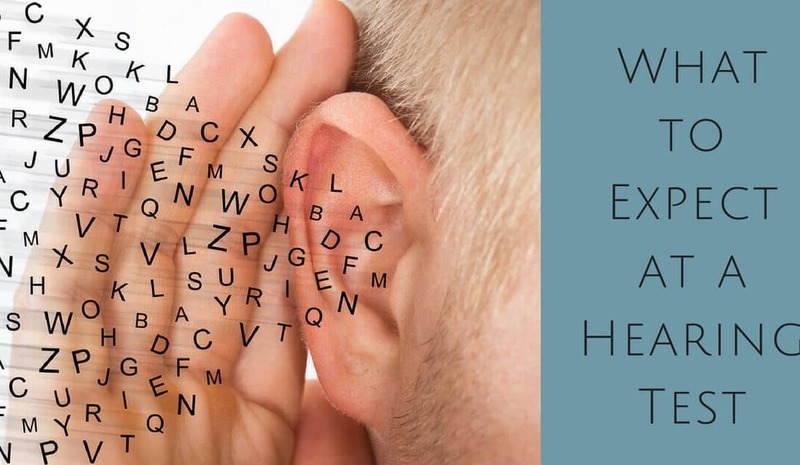 During the speech recognition test, your hearing specialist will read you a series of words and you will be asked to repeat them. The volume for the words will begin at a low volume and rise until you can hear them. Again, you will be tested one ear at a time. Results: The results of your hearing test are recorded on an audiogram, a visual representation of your hearing abilities. Each ear’s ability will be graphed separately, in terms of decibel and frequency levels. The result for speech recognition is usually recorded as a percentage. There are two possible results for an audiogram: normal or experiencing hearing loss. The audiogram indicates to your hearing specialist the configuration, degree, and type of your hearing loss. After the hearing test, our team will review your audiogram results with you. If a hearing loss is detected, we will go over the different treatment options available to you. The most common form of treatment for hearing loss is the prescription of hearing aids. Our team will work with you to find hearing aids that best fits your lifestyle and needs, as well as your budget. We offer a diverse range of hearing aids that are versatile and equipped to keep up with the most active of lives. To learn more, contact us at Able Hearing today.